Alfhild Agrell was one of the most noted dramatists of the 1880s. Her written output was comprehensive and comprised a range of different genres. Alfhild Agrell was born in Härnösand, where her father worked as a pastry chef. Her family was financially comfortable and belonged to the town’s upper social echelons, despite her father’s social position as a tradesman. The exact nature of Alfhild Agrell’s education remains unclear but surviving documents reveals that she was very musical. Six months after her father’s death in 1868 she married Pehr Albert Agrell, a merchant who was ten years her senior. They settled in Sundsvall, where she became an active member of the town’s amateur drama society. When Pehr Albert Agrell was appointed commissioner to Stockholm’s merchants’ association in 1876 the couple moved to the capital. Alfhild Agrell made her debut in 1879 with a novella entitled “Skymningsprat”. It was published in Dagens Nyheter using the pseudonym Thyra. Alfhild Agrell was exceedingly productive in the ensuing years. 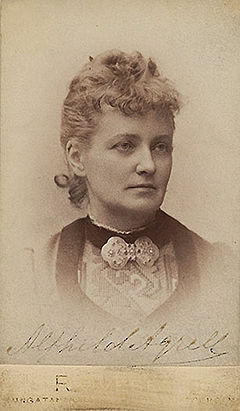 During the 1880s she was an active member of Stockholm’s literary and intellectual circles and socialised with several of the young and radical authors now identified as Det unga Sverige (Young Sweden). She became good friends with Anne Charlotte Leffler, Calla Curman and Ellen Key. She was elected into prestigious groups such as Svältringen and Nya Idun, as well as Publicistklubben (publicists’ club) in 1885. Alfhild Agrell was most successful as a dramatist. She made her debut as such with two one-act pieces entitled Varför and En huvudsak. The former premiered at Dramaten (Royal Dramatic Theatre) in 1881, the latter premiered at Nya teatern in 1882. Her major breakthrough as a playwright came with the problem drama Räddad. Interiör i tvenne akter, which was performed at Dramaten in 1882. She was still working under the pseudonym of Thyra, but her success led to her true identity being revealed. When Alfhild Agrell released Dömd, 1884, and Ensam, 1886, she did so using her real name. Räddad is often rightly described as influenced by Ibsen’s A doll’s house. However, to do the play justice it is important to recognise how Alfhild Agrell enters into a dialogue with Ibsen and delivers a harsh critique of both his play and the contemporary view of women. Unlike Ibsen’s play, Räddad does not portray any exemplary female characters, but rather women who have been damaged and perverted by the male dominance and feminine ideals of the time. The play’s ending also lacks the utopian vision of Ibsen’s play. Alfhild Agrell’s female lead character leaves her home carrying her dead son. The implication is that she is about to commit suicide but the outcome is left unstated. This play spoke directly to the contemporary debate and was performed no less than 26 times at Dramaten, which was many more times than any of Strindberg’s plays in the 1880s. It was also performed in Gothenburg, Copenhagen, Berlin, and London. Alfhild Agrell’s next play Småstadsliv, 1883, is rather different in character. It is an entertaining comedy which powerfully mocks the small-town mentality which Alfhild Agrell had encountered in Härnösand and Sundsvall and the rivalry between the two towns. This play also found favour with the reviewers. The thematic sequel to Räddad was released the following year, namely Dömd, a somewhat unusual drama centred on a key polemical issue of the time: sexual morals and illegitimate children. The key figure of the play is Valborg, a young governess who has had an illicit relationship with a man who abandoned her when she gave birth to his son. The same man then re-appears as a suitor seeking to marry the daughter in the household Valborg works for. When Valborg reveals the man’s history in an attempt to prevent the marriage it is she who is judged and not him. Dömd and Räddad were both major successes. So too was Alfhild Agrell’s next drama Ensam, 1886. This play also focuses on contemporary moral double standards. Unlike most unmarried mothers in literature, the unmarried female lead character Thora has cared for her daughter, Yngva, who has just come of marriageable age. However, it becomes apparent that the foster father of Yngva’s future husband is the same man who ruined Thora’s life by not revealing that his brother, who Thora was in love with and had a relationship with, was married. Now this same man demands that Thora marry him in order to legitimise Yngva and render her a suitable partner for his foster son. Thora flatly refuses as she does not love him, which leads to Yngva breaking off contact with her. Through Räddad, Dömd, and Ensam Alfhild Agrell became one of most treasured playwrights of her era. However, she also faced plenty of dissent. Opinions emerged from within the women’s movement declaring that it was immoral to turn a fallen woman into a heroine. Some also believed that Thora was wrong: a mother should always sacrifice herself for her children. However, Alfhild Agrell’s strongest critics were the men railing against the literary and dramatic “kjolväldet” (the tyranny of the skirt), as Ola Hansson put it in a letter to Oscar Levertin. Alfhild Agrell was in the firing line of many attacks directed against the female authors of her day. A critical article, published under the pseudonym Stella Kleve but written by a young author called Mathilda Malling, became decisive for both Alfhild Agrell’s writing and for future literary historiography. The article was entitled “Om efterklangs- och indignationslitteraturen i Sverige” and was published in the journal Framåt in 1886. No further plays written by Alfhild Agrell were ever staged. However, later on in her life she returned to one of them called Ingrid. En döds kärlekssaga, which she published in 1900. She recited it herself to a full audience in the hall at Vetenskapsakademien (Academy of Sciences). By the late 1880s Alfhild Agrell had been reduced to an “indignationsförfattare” (author of outrage). She changed genres and began to publish comedic pieces using the pseudonym Lovisa Petterqvist. She gained a sizable readership and garnered a lot of praise for her teasingly satirical diary novels I Stockholm, 1892, and Hemma i Jockmock, 1896. These became her most financially profitable works. The former was printed in no less than six editions, while the latter was released in four editions. In these books Alfhild Agrell plays the urban against the rural and constructs a rural perspective, which is also critical of culture, through the middle-aged, talkative Lovisa from Norrland. Alfhild Agrell also saw to it that her former critics, such as Ola Hansson, August Strindberg, and Carl David Af Wirsén were at the receiving end, along with Dramaten and Svenska Akademien. Alfhild Agrell had already previously explored the highly popular format of literature depicting rural and everyday life. Her first depiction of rural life Från land och stad was released in 1884, followed in 1887 by På landsbygden. The former included drawings by Victor (Vicke) Andrén and the latter was illustrated by Elsa Beskow. Alfhild Agrell’s collection entitled Nordanfrån, released in 1898 under the pseudonym of Stig Stigson, marked a return to serious depictions of everyday life with a Norrland focus. The collection, comprising everyday life stories mainly from Ångermanland and Jämtland, including some in dialect, generated major positive reviews from critics and readers alike and was printed in several editions. Later on Alfhild Agrell also developed an interest in the Sami, both for their lifestyle and culture, and in 1919 she published a collection of novellas entitled En Lappbok. Alfhild Agrell’s final major and, according to her, most serious literary effort was the novel Guds drömmare, 1904. It is in many ways completely unlike anything else she had written and, as noted by the reviewers of the day, conveys an intensity and strong degree of urgency. The ethereal and idealistic figure Margareta is the central character. She is driven by her desire to make a difference to her fellow humans and meets Åke, a young priest on her journey. However, neither of them have the strength that is required of them and, in the end, Margareta dies in Åke’s arms. This novel was yet another success for Alfhild Agrell. After divorcing her husband in 1895 Alfhild Agrell led a nomadic lifestyle mainly between Stockholm, Gnesta, Copenhagen, and Aneby in Jönköping county. The final years of her life saw her endure financial hardship, very poor health and psychological problems. She died at a nursing home in Flen in 1923. She is buried in her parents’ grave at Säbrå cemetery near Härnösand. Alfhild Agrell has long been overlooked and forgotten within modern literary historiography. However, during the twenty-first century she has begun to regain her position as one of the most interesting, important, and far-sighted female authors and playwrights of the late nineteenth century and early twentieth century. Atrium publishing house republished her plays in 2012. Ingeborg Nordin Hennel’s biography Alfhild Agrell: rebell, humorist, berättare, published by Atrium in 2014, has also been a significant factor in the re-evaluation of her work. The Alfhild Agrell society was established in 2012, based in her birth town Härnösand. Alfhild Theresia Agrell, www.skbl.se/sv/artikel/AlfhildAgrell, Svenskt kvinnobiografiskt lexikon (article by Lisbeth Larsson), retrieved 2019-04-23.